See Mark Mitchell’s costume design in Angels in America: 8/12–9/21. Cornish Playhouse at Seattle Center, 201 Mercer St.; 206.315.5838; intiman.org. For updates on the Burial project, visit markmitchellburial.com. 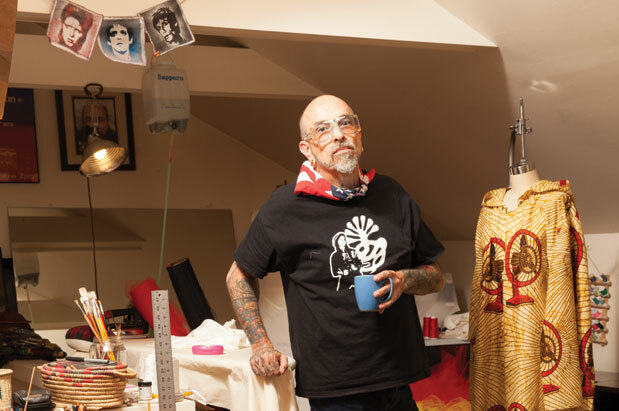 He may not have created wings before, but since arriving in Seattle in 1984, Mitchell has crafted all manner of heavenly couture, for burlesque stars, contemporary dancers, drag queens, brides, actors, bon vivants—and lately, the opposite. Mitchell made a splash on the avant-garde art scene last September with a solo show at the Frye Art Museum, Mark Mitchell: Burial. It featured nine exquisitely crafted garments he called “ensembles to clothe the dead.” The designer used his decades of experience in fashion and costuming to present a stunning collection of white silk dresses, tunics and loose pants—layered, embroidered, buttoned and ruffled—with slippers that would never be walked in. On opening night the models laid on the floor, absolutely still, playing dead. It was breathtaking. With the vestments he created something more than clothing, combining his painstaking craftsmanship and theatrical flair with an overarching philosophy. “Death is coming for us all,” he says with a smile, “and it’s nothing to fear.” Mitchell’s gallows humor is earned. He has been living with HIV for the last 21 years, and during the AIDS crisis, he saw friends die all around him. While he’s in generally good health now, he is well aware that long-term HIV patients are more likely to die of sudden cardiac arrest. Every day, he thinks, “Did I try to make an effort today? Or was I feeling sorry for myself?” Like so many whom death has gripped by the lapels, he feels an urgency to make his life meaningful. (Joking about the cost of HIV drugs, he says, “I’m very expensive to keep alive. I want to be worth it.”) Out of respect for those who passed, he says, “I feel a responsibility to work hard and not get stuck in a pit of despair.” Mitchell knows the contour of that pit well—he crawled down into it for years after his diagnosis, numbing the pain with alcohol and hard drugs. He was going to die soon anyway, he figured, “So why the hell not!” But the longer he lived, the more it seemed like a good idea to stick around, especially after meeting Reighley, who Mitchell says “showed me I was worth living a real life.” When he turned 50, he made the conscious decision to close his party-boy era entirely, giving up “old thinking, old relationships and mourning for so long.” Now he suspects he was making the mental space for his Burial odyssey. “I enjoy all of my commissions and collaborations,” Mitchell says, which currently include designing a touring wardrobe for Seattle hip-hop artist Tendai Maraire. “But doing my own personal work is what matters. It’s the truest to my vision.” He’s already mentally designing his second Burial collection, which he hopes to show in early 2016. In May, The New Foundation Seattle admitted him to its Artist Program, which helps finance exhibits by local artists at galleries outside of Seattle. His mission is clear: “I want to shorten the distance between people and death, so it’s not so scary,” he says. “That’s why my burial garments have so many buttons—so mourners can spend time with the body, so you aren’t so distanced from the process.” But for the moment he’s focused on Angels, a play he says is important to him, perhaps especially given its message of perseverance in the face of tragedy. “I think people will see it again and be surprised at how prophetic it turned out to be,” he says. He also hopes younger people who didn’t witness the AIDS crisis will understand that the humor of the play is vital. Referring to a memorable scene, he says, “I feel like I wrestled with the angel of death, too, and I’m able to laugh about it now.” In his home studio, under pictures of David Bowie, Lou Reed and Iggy Pop—a personal sort of seraphim—he holds up a swath of fabric: off-white, vintage raw silk with a divine shimmer.